NATO member Estonia has held a military parade in border town of Narva, just 300 meters from the Russian border. Tallinn is a long-time critic of Moscow, which it accuses of having an aggressive policy towards the Baltic nation. Tuesday’s military parade was dedicated to Estonia's Independence Day. Chief military commander Lt. Gen. Riho Terras headed the troops as President Toomas Hendrik Ilves reviewed them. 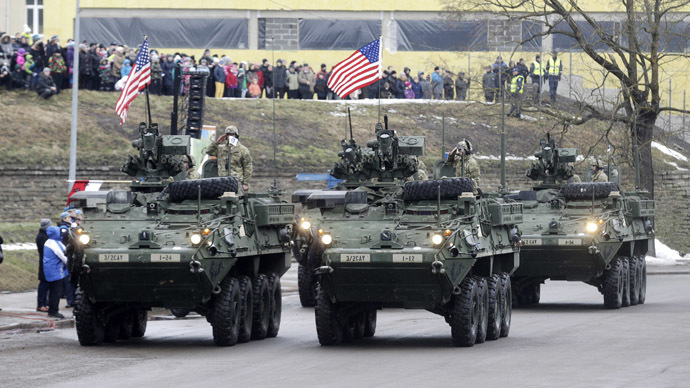 Over 140 pieces of NATO military hardware took part in the parade, including four US armored personnel carriers M1126 Stryker flying stars-and-stripes. Another foreign nation, the Netherlands, provided four Swedish-made Stridsfordon 90 tracked combat vehicles (designated CV9035NL Mk III by the Dutch). Estonia also showed off its own howitzers, anti-tank and anti-aircraft weapons, armored vehicles and other hardware. Over 1,400 troops also marched the streets of Narva. The parade is an obvious snub at Estonia's eastern neighbor Russia, whom it accuses of pushing aggressive policies in Eastern Europe. The Estonian government is among several vocally accusing Russia of waging a secret war against Ukraine by supplying arms and troops to anti-Kiev forces in the east. Moscow denies the accusations, insisting that the post-coup government in Kiev alienated its own people in the east and started a civil war instead of resolving the differences through dialogue. NATO seized the Ukrainian conflict as an opportunity to argue for a military build-up in Eastern Europe, supposedly to deter a Russian aggression. The three Baltic States are among the most vocal proponents of this policy. Russia sees it as yet another proof that NATO is an anti-Russian military bloc that had been enlarging towards Russia's border and compromised its national security. The Estonian government defended its right to hold whatever military maneuvers it wants in its territory. “Narva is a part of NATO no less than New York or Istanbul, and NATO defends every square meter of its territory,” Estonian Prime Minister Taavi Rõivas said in a speech in capital, Tallinn. Historically Narva was a point of centuries of confrontation between Russia and Sweden, when the two nations fought for dominance in the region. The city changed hands several times and ended up under Russian control in 1704, serving as a military outpost for decades. The city was again contested in the wake of the Bolshevik revolution of 1917 and the dissolution of the Russian Empire it triggered. Narva took turns between being governed by the self-proclaimed Estonian Republic, occupying German troops and the Red Army until eventually becoming Estonian again under a peace treaty between Estonia and Russia. It then changed hands between Nazi Germany and the Soviet Union along with the rest of the Baltics during World War II and went on to be part of an independent Estonia in 1991.